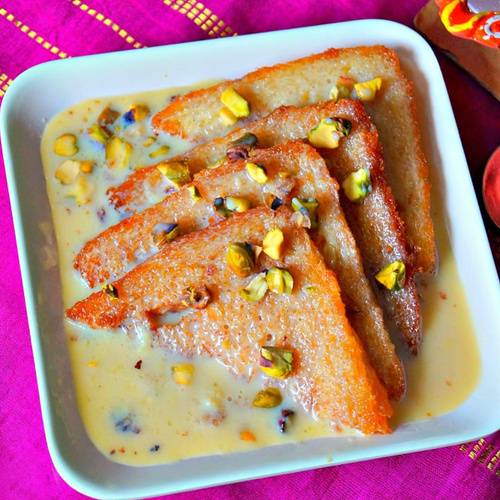 Shahi tukda recipe which is similar to or same as the Hyderabadi Double ka meetha, that has originated during the Mughal reign. Cut the bread into triangles. Start making rabri by heating milk. As the milk boils the cream will come up. Remove it to the side of the vessel using a spoon and keep stirring the milk. Add 1/4 cup sugar and cardamom powder and stir till the milk reduces to 1/4th and is thick. Let the rabri cool on the counter top. Make a sugar syrup by boiling 1/2 cup sugar in one cup water. Add two whole cardamoms and few strands of saffron to this sugar syrup while boiling it. When it reaches one string consistency, (that is when you press the sugar syrup between your thumb and a finger it should stretch like a strand),the syrup is done. Now heat ghee in a pan and deep fry the bread slices over low flame. Take the bread slices from the ghee and dunk it in the sugar syrup. Set the slices then on a plate after draining the excess sugar syrup. Pour the rabri over the sugar dunked bread slices and decorate with pistachios and cake decors. Chill before serving. You can have it immediately too. Thaw the shahi tukda before serving if you refrigerate it.